looking graphics and superior gameplay. written expressly for the SNES. 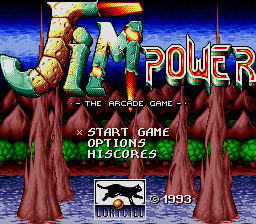 I've played Jim Power ("Jim Power and the Lost Dimension in 3D") on SNES and it looks nearly identical to the screenshots you have of this game. 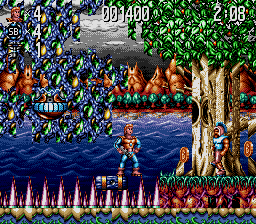 The only difference I can think of is that one of the interesting features of the SNES version is that it supported 3-D glasses, and all of the game's graphics were optimized to support them.